Cutting tools systems supplier, Webtool, has supplied marine salvage specialists Resolve Marine with 12 softline cutters for a decommissioning project offshore Mumbai. The 127-mm cutters will be positioned on fibre rope, soft eye slings and activated simultaneously to complete the scuttling of a rig jacket leg. During decommissioning, the jacket leg is lifted by a barge via 12 chain tensioners attached to the softlines. The jacket is then suspended horizontally with the softline slings arranged in two groups of six along two of the jacket’s four legs. 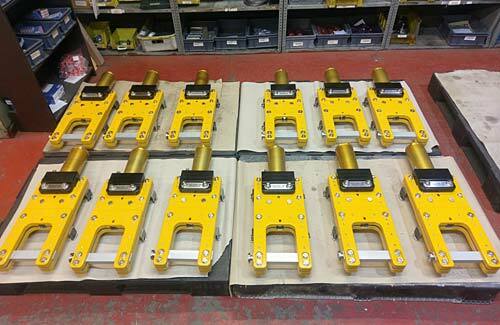 The Webtool cutters are designed to be attached to the softlines either subsea or topside on the vessel, as required. Once the jacket leg is moved into place, the softlines will be cut simultaneously, powered by a diesel powered, hydraulic power pack on the salvage vessel. The Webtool softline cutter is lightweight (approximately 29 kg in air) aluminium construction with stainless steel blades. It operates at a max working pressure of 345 bar. The cutters combine the blade and hydraulic power used for Webtool’s range of softline cutters with Webtool’s wire rope anvil cutting action. Suspended from the rigging, each cutter’s anvil is opened while the line is positioned in the cutter. Once in position the anvil is locked shut in preparation for the cut. “In this application the normal, open-sided, softline cutter is inappropriate as we want to ensure all the cutters complete the cut at the same time. Using the anvil design, we’re able to hold each softline in position ensuring the simultaneous cut of all 12 lines,” says Keith Elliot, engineering director, Allspeeds Ltd.
For the decommissioning project, the Webtool softline cutters will be used to cut 76-mm diameter Dyneema softline rope. By opting for a larger diameter cutter, Resolve Marine can use the cutters on future salvage and decommissioning projects involving softlines, fibre ropes and lifting slings including aramids, Dyneema, Spectra and Twin-Path.